You bring the party, we’ll bring the hundreds of thousands of twinkling lights! A holiday party at Blossoms of Light is a great way to celebrate the end of the year with your friends, family, or colleagues. Choose from one of four versatile and unique indoor spaces to offer you guests a warm retreat when they aren’t outside enjoying our glittering winter wonderland. With booking options available every night of the week, we can accommodate parties large and small. Holiday party packages include a Blossoms of Light ticket for each guest in attendance, as well as a limited quantity of tables and chairs. Book your party today and treat your guests to the best-decorated holiday party in town! 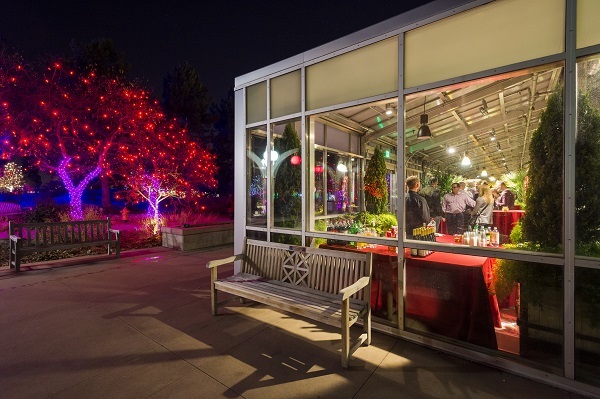 Contact us for more information at private.events@botanicgardens.org or 720-865-3551. Jamie, someone from the Gardens Private Events team will be contacting you soon. Thanks for the request!